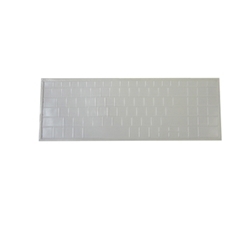 Description: New laptop keyboard skin for Acer and eMachine laptops. US layout. Will not work with international models. This is a high quality cover that connects through peeling the tape off the adhesive and it seals around the keyboard. The tape is still on in the picture. These form fitting covers fit perfectly over the keys and are used in the healthcare industry as well as in laboratories, clean rooms, point of sale, educational and special needs applications. The covers keep the keyboard clean and also add to the life of the keyboard. We carry thousands of other products like this so please contact us with any inquiries that you might have. Other parts pictured beside the clear keyboard cover are not included. Acer Aspire 5250, 5251, 5252, 5253, 5336, 5338, 5349, 5410, 5410T, 5536, 5536G, 5538, 5538G, 5542, 5542G, 5551, 5551G, 5552, 5552G, 5553, 5553G, 5560, 5560G, 5625, 5625G, 5733, 5733Z, 5736, 5736G, 5736Z, 5738, 5738DG, 5738DZG, 5738G, 5738P, 5738PG, 5738PZG, 5738Z, 5738ZG, 5739, 5739G, 5740, 5741, 5741G, 5741Z, 5741ZG, 5742, 5742G, 5742Z, 5742ZG, 5745, 5745G, 5745P, 5745PG, 5750, 5750G, 5750Z, 5750ZG, 5810, 5810T, 5810TG, 5810TZ, 5810TZG, 5820G, 5820T, 5820TG, 5820TZ, 5820TZG,7250, 7336, 7535, 7535G, 7540, 7540G, 7551, 7551G, 7552, 7552G, 7735, 7735Z, 7735ZG, 7736, 7736G, 7736Z, 7736ZG, 7738, 7738G, 7739, 7739G, 7739Z, 7739ZG, 7740, 7741, 7741G, 7741Z, 7741ZG, 7745, 7745G, 7745Z, 7750, 7750G, 7750Z, 7751, 7751G. eMachines E440, E442, E530, E640, E640G, E730, E730G, G640, G640G, G730, G730G.